George Graham Reviews Fairport Convention's "XXXV"
Rock music is well-known for its short-lived fads. But even those of us who grew up in and witnessed the music's seminal period in the 1960s, might have had difficulty imagining that some groups from then would still be around in the 21st Century -- not only just being together, not just playing the nostalgia circuit, but flourishing creatively . This week we have an excellent example of a highly influential band who are still making music with a founding member and a 30-plus year veteran, and are celebrating three and a half decades together with a new release appropriately called XXXV. They are Fairport Convention, the first, best-known, and most influential of the English folk rock bands. Their style continues to attract a small, but devoted following on both sides of the Atlantic. Like the Pentangle and Steeleye Span who appeared at about the same time in the late 1960s, Fairport Convention drew on both traditional songs and electric instrumentation. 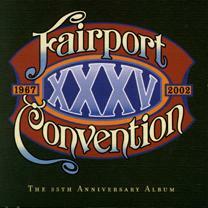 Fairport were also not afraid to create their own material -- the group's best-known early figures, Richard Thompson and the late vocalist Sandy Denny both created music that remains in the repertoire of many a folksinger -- and they borrowed songs from such people as Bob Dylan and even 50s rocker Dion DiMucci. And while Fairport absorbed music from a lot of sources, they were also hugely influential to other performers, such as singer-songwriters, and even groups like Jethro Tull. Throughout the Seventies and Eighties, Fairport was not a full-time band, but they got together for special occasions, and for a more than a decade have been presenting their own annual music festival in Cropredy, England. And lately have been doing more extensive touring. Fairport Convention are marking the 35th anniversary of the time when Simon Nicol and some friends got together at the house where he was living, which in the great English tradition, had a name, Fairport. To mark the occasion, they are involved with a world wide tour, have released a video, a multi-disc retrospective CD, and this new collection called XXXV (expressed in Roman Numerals). With more than three decades together multi-instrumentalist Nicol and Dave Pegg remain, along with violinist Ric Sanders, who has been with them since the early 1990s, and drummer Gerry Conway, who spent some time with another durable English folk band, the Pentangle. Fairport's newest member is another multi-instrumentalist Chris Leslie, who also contributes significantly to the songwriting on the new CD, and is heard on lead vocals on a few tracks. The group's sound is not significantly altered from their work of the recent past. They are a bit more electric than they were when they first started, but the traditional elements of their style are never very far beneath the surface, especially with the prominence of the fiddle, albeit electric violin. For the new CD they perform a combination of new material -- with three pieces by new member Leslie -- traditional songs and four remakes of previous Fairport classic. I guess if a group has been together for 35 years, that entitles them to re-do old songs, and they do give them different treatments. It's definitely an accomplishment for a band to be together for 35 years, and even more so to keep making new and interesting music. Fairport Convention certainly deserves the celebration they are doing this year to mark the occasion with a world tour and the release of this CD. Original members Simon Nicol and Dave Pegg remain true to the band's founding principle of mixing traditional English folk with rock, combining original music with very old songs. The instrumentation is a little more electric-sounding than three decades ago, and the changes of personnel have obviously altered the band's sound some. But XXXV is a testament to both the durability of the band, and also to the English folk-rock style, which remains as relevant and distinctive now as it was in the late 1960s. The result is a very enjoyable album, with a decidedly upbeat mood. Our grade for sound quality is an "A." The CD is mixed well, though I might not have gone for such a rock-influenced drum sound. But there's decent dynamic range and studio artifices are kept to a minimum. Whether you have been a fan of English folk-rock for more than three decades or are relatively new to the sound, Fairport Convention's XXXV, is a worthy addition to the long, and estimable history of the style, created by some people who were there from the beginning.